Our next screening is the absolutely unmissable 120 BPM, on Monday 14th May at the Connaught cinema at 8.15pm. 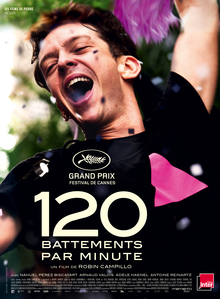 120 BPM has been a critics favourite since it won Grand Prix (second prize) at Cannes, and it went on to win six awards at the Césars (French Oscars), including Best Film, Actor, Screenplay and Editing. This stunning film from director Robin Campillo is set in early 90s Paris, where we follow the activist group ACT UP (AIDS Coalition to Unleash Power). ACT UP were a direct action organisation fighting the AIDS pandemic and helped to bring about legislation, medical research, and ultimately treatment and policy changes. It's written and performed with an incredible confidence and energy, and it's no surprise that Writer/Director Campillo also wrote the excellent Palme d'Or winning THE CLASS (2008). During the film we follow one relationship, as the film merges the personal and the political to devastatingly powerful effect. 120 BPM is a vital account of that time in history, and is definitely not to be missed.